GRANDMA'S FLOWER GARDEN - FIFTY YEARS IN THE MAKING! Grandma's Flower Garden - 50 years of love! My mother started this quilt when she was pregnant with my oldest of four brothers in 1953-54. She'd sew a little and then put it aside and start on something else. However, as the years rolled by, she was mostly consumed with caring for five children, all just one year apart; I still don't know how she did it! In addition to gardening and canning, mom made most of our clothes and taught me (the youngest and only girl) to sew at a very young age. I remember standing at the end of the sewing table, watching my face go round and round on the hand wheel. When I reached my teens, I picked up the cigar box filled with little quarter sized hexagon fabrics, cut from left over scraps of favorite dresses and play wear, and began hand sewing many of them together. Then I married and moved out, began a family of my own and the little cigar box sat at rest gathering dust for several more years. The kids and grandkids grew up and no longer needed much of mom's attention, and to my wonderful surprise, mom found time once again for her craft and finished all the little hexagon flowers. I don't know exactly how many it took, but trust me, it's a lot! She presented Grandma's Flower Garden to me on my 45th birthday, 50 years after she's cut out that first little hexagon. So, we call it "our" collaborative 50 years of love in the making, though I give her much more credit for its completion than myself. I proudly have it displayed now in my home, remembering at every gaze each little home sewn school dress that eventually became a part of my wonderful keepsake. Mom is a fantastic quilter and has completed numerous quilts for all her children, grandchildren and now great grandchildren. I have time now to devote to the craft and am beginning to make my own collection of pieced fabric art. My daughter, Lindsay, is a fashion designer, so I guess the apple doesn't fall from the tree when it comes to fabric, pins and thread. So here's a huge heart felt thank you to my mom, Emma Cruise, of Mogadore, OH for all the beautiful keepsakes and the wonderful lessons and legacy. Comments for GRANDMA'S FLOWER GARDEN - FIFTY YEARS IN THE MAKING! I still have a quilt that Tina and I's grandmother (Aunt Emma Lou's mother) made for my baby doll crib. I also have a quilt top that my great aunt (grandma's sister) made for my wedding gift. Our grandmother and many of her children, grandchildren and great-grandchildren are incredible artists, craftspersons, quilters, woodcrafters, masons, designers, needleworkers and more. It never ceases to amaze me how talented our family is! I loved reading your story about the quilt. Thats what I like about quilting, so much goes into each stitch. I have been making a quilt for the last year and I have a job, two dogs that need walking everyday a son partner so dinners to cook and washing to do etc, but my time sewing is the best time for me. I am also just starting another hexagon quilt I have no time limit, it will just come together when its ready......I usr old clothes and buy a piece of fabric if it stands out. I tend to mix a lot of colours together. I find it more interesting.....keep on quilting! Aahhh, the Quilt that love built! I thoroughly enjoyed your recounting the memories of this beautiful quilt. I have just learned how to do English Paper Piecing, and am just starting to create my first "Grandma's Flower Garden" quilt. I am 57, so I hope it doesn't take me 50 years! LOL! To Sharon, regarding storing your other quilt in plastic in the closet, I just read on an Amish quilt site that storing quilts in plastic is damaging to them, due to off-passing from the plastic. They highly recommend storing quilts in a muslin bag; very easy to.make, too. When one shells out big bucks for the hand-quilted quilts, they send them WITH the cloth storage bag. I guess I'm inclined to pay attention to them. I just keep learning new hints every day! Your story is as if I wrote it myself. 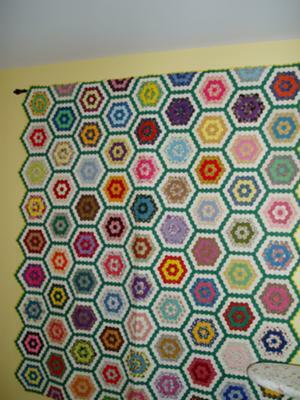 My mom made our clothes as well as several quilts through the years.Her lst quilt she made was grandmas flower garden. She tought me the grandmas flower garden 1 year before she passed, it has taken me 3 years, but I finally got it done(ready to quilt).I inherited alot of fabric and have enjoyed making this quilt and reminessing all the scraps as being a piece from the dress she made me as a child.Brought tears to my eyes when I read your story. Thank you so much, I loved it!!! Perusing your web page is such a wonderful interlude and balm for frenetic days. Your many creative talents are evident in every word--portrying not only your experience, but providing a pathway for your viewers to relive their own. Tina - keep up the good work of making beautiful things. One never knows where her work will end up over the years. You have expressed talent and love in whatever initiatives you have undertaken, be it your work, your home, your play, or your day to day relationships with people. These talents are definitely learned and passed from one to another, as the beautifully written legacy to your Mom clearly indicates. Lucky Lindsay, to have two outstanding talents and lovely role models in her life - quite a garden for her! You write as well as you sew... and as you do so many other things! The quilt is a wonder... full of lively colors, detailed work, perseverence, and love. It is indeed a lovely tribute to your mom, and a wonderful remembrance of loving times past. What a beautiful tribute to your mother and how much more to be cherished with the memories of working on the quilt together. Now it is your turn to work on memories for your beautiful daughter. God bless you. What a treat to read your story and the see the amazing quilt you and your mom worked on. I know you'll be busy working on your own quilt and I look forward to seeing that displayed before 50 years pass by. Get stitchin!! Your Grandma's Flower Garden quilt is a beautiful heirloom. I so enjoyed reading your heartfelt story of your Mother's life and her love of quilting. I have also finished a quilt started by my mother inlaw in the early 1940's. It was truly a work of love.